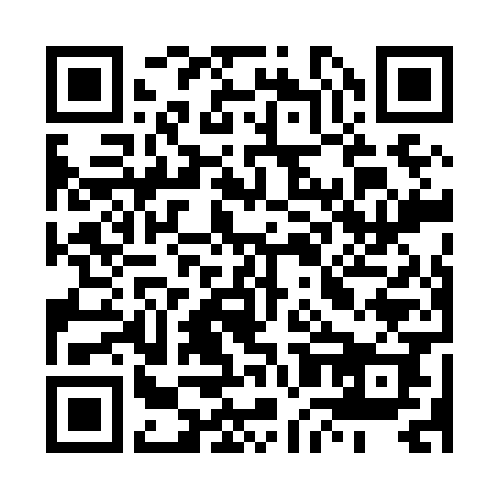 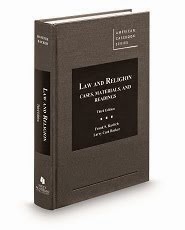 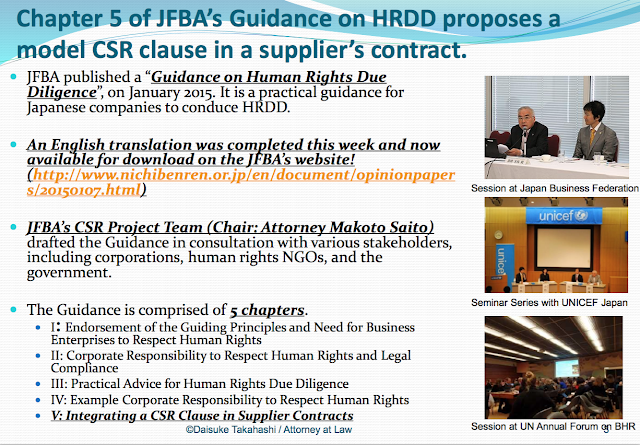 I am happy to pass along the information that an English translation of Japan Federation of Bar Association's (JFBA's) Guidance on Human Rights Due Diligence has been completed and is now available for download on the JFBA's website. 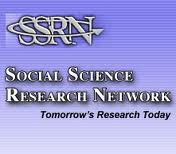 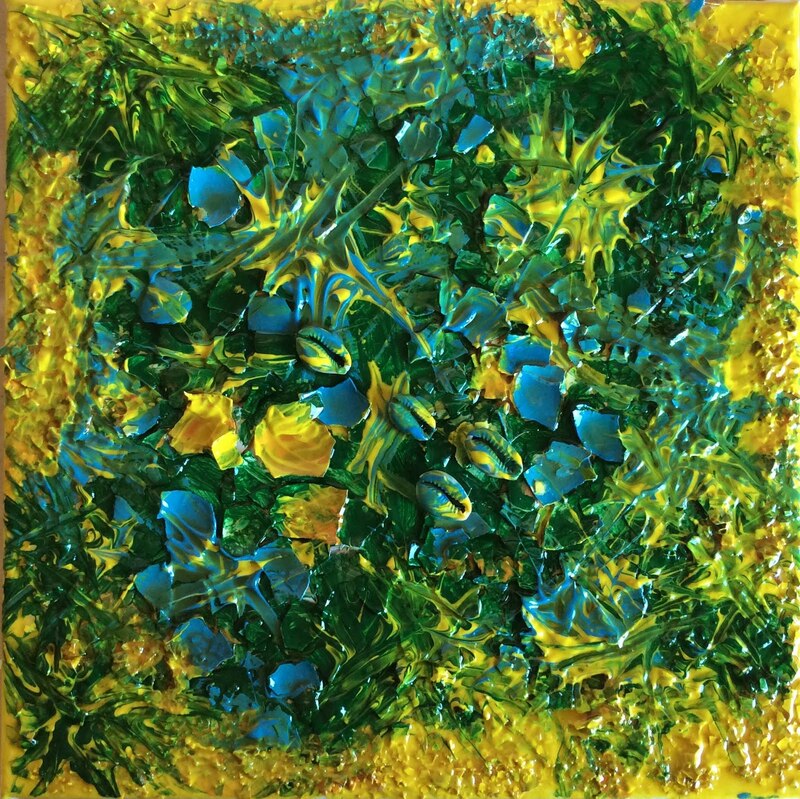 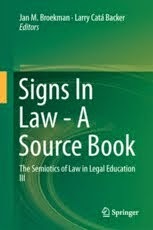 In 2008, the JFBA first published its Corporate Social Responsibility (CSR) Guidelines, v. 2007. The Guidelines were later revised (v. 2009). 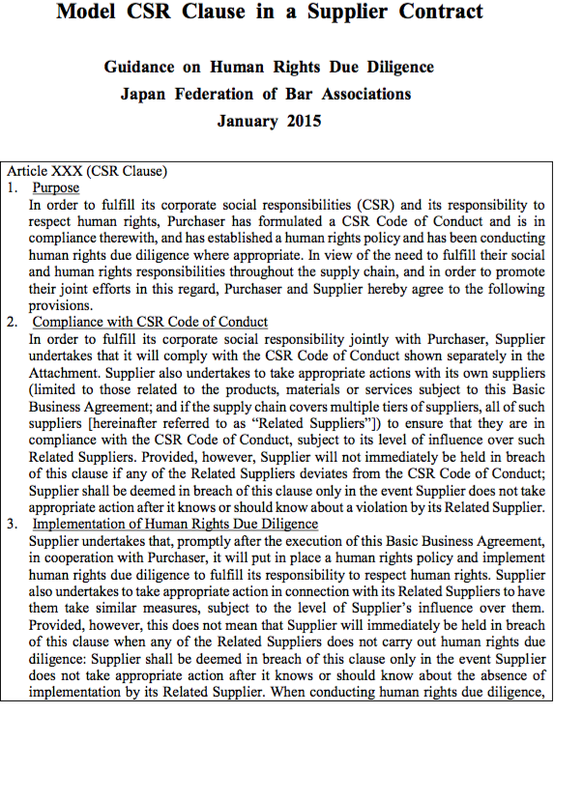 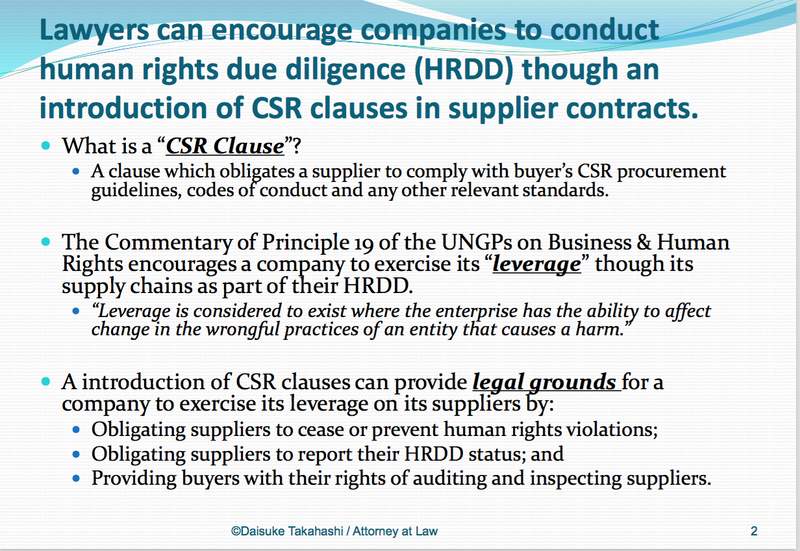 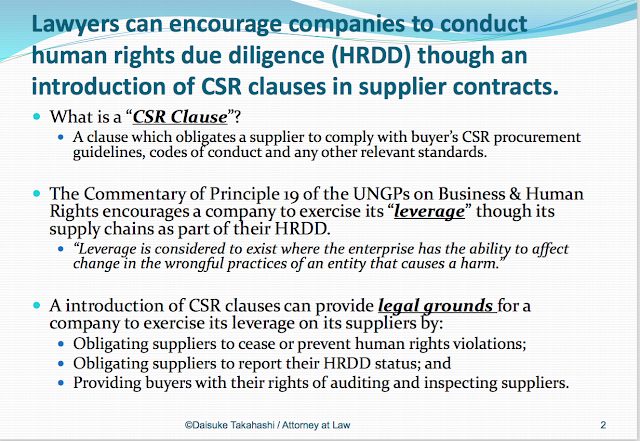 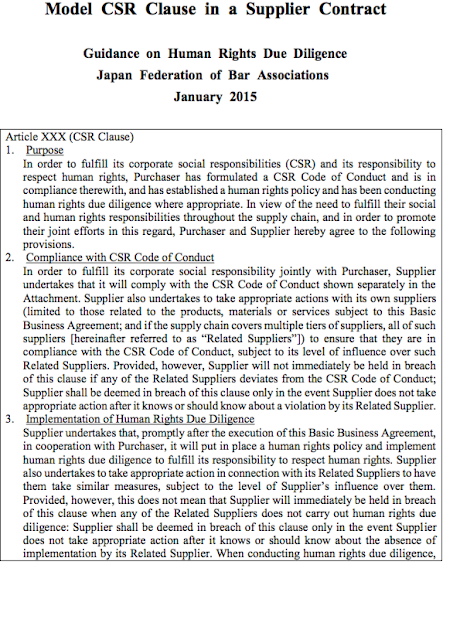 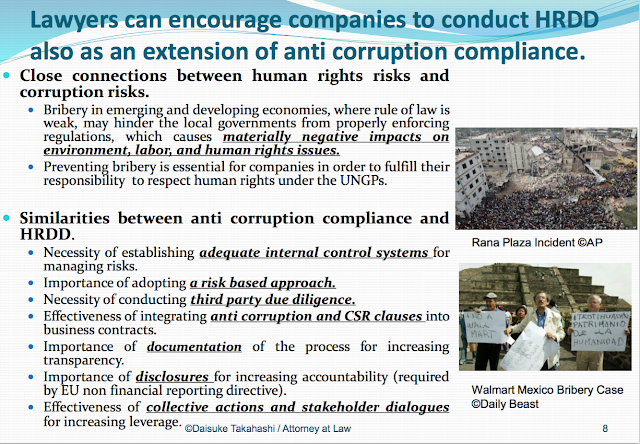 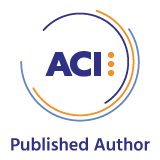 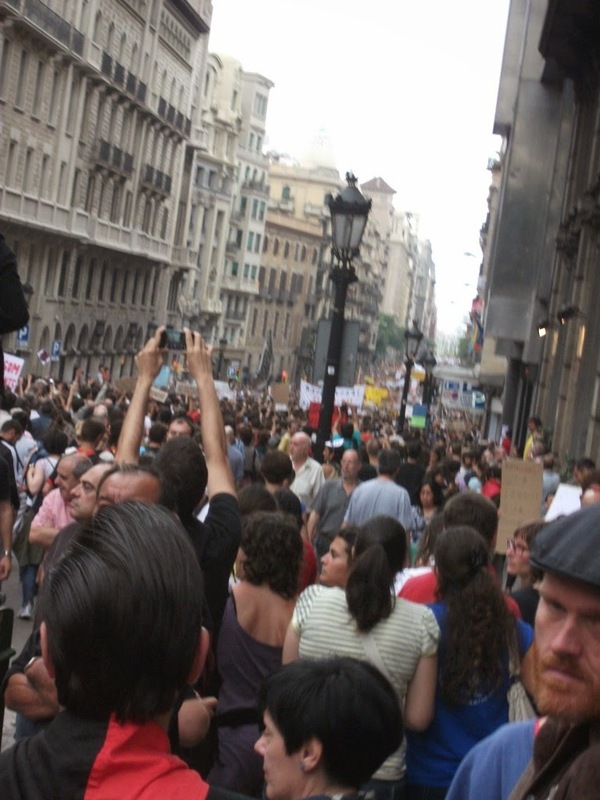 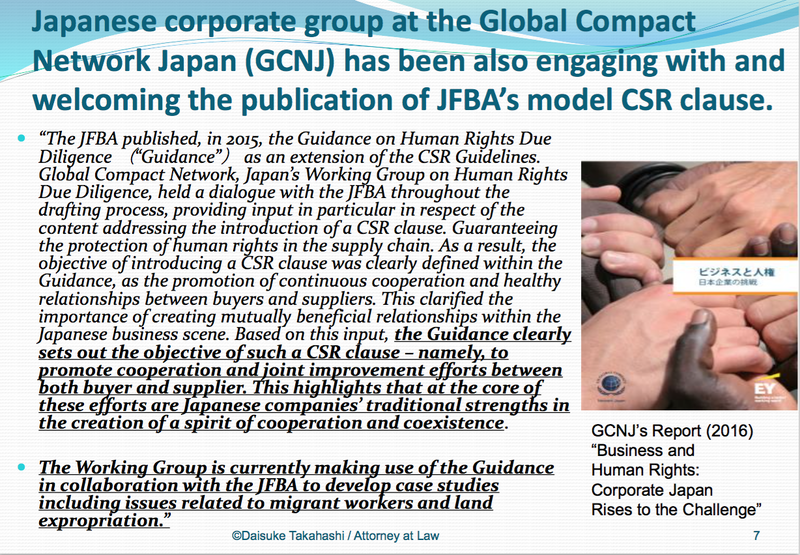 This current Guidance for Human Rights Due Diligence (Jan. 2015) was published as the result of activities extending from the Corporate Social Responsibility (CSR) Guidelines and now translated for wider circulation. Daisuke Takahashi had an opportunity to discuss the Guidance and related issues in the International Bar Association's Annual conference in Washington, D.C. last week. 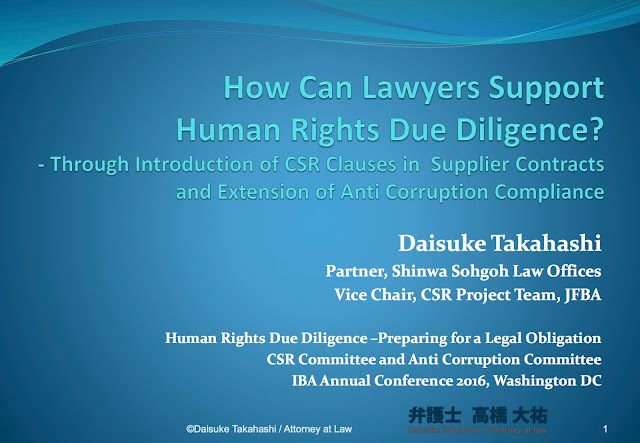 Mr. Takahashi is the Vice Chair of the CSR Team of the Japanese Federation of Bar Associations (since 2013), and an Expert Committee Member, Japan CSR Promotion Association (since 2012). 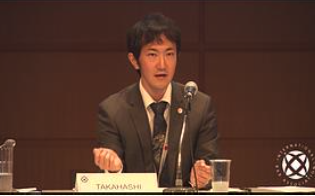 Mr Takahashi had spoken earlier about the Guidance (see HERE). 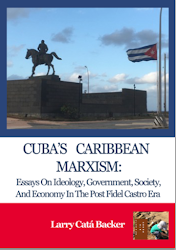 And this reflects a refinement of the ideas and an opportunity for English speaking audiences to more carefully study the text. 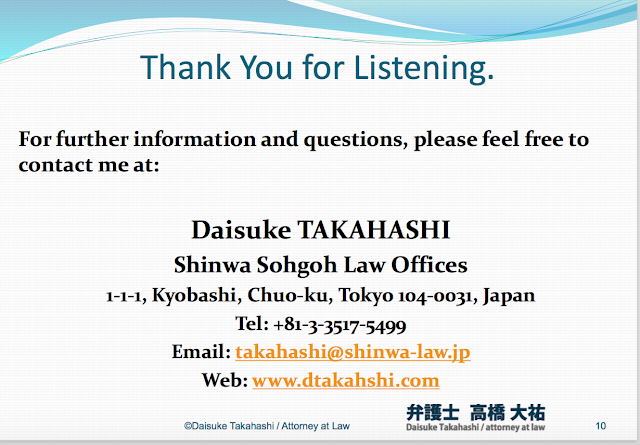 Mr. Tahahashi had very kindly given me permission to share his presentation slides. 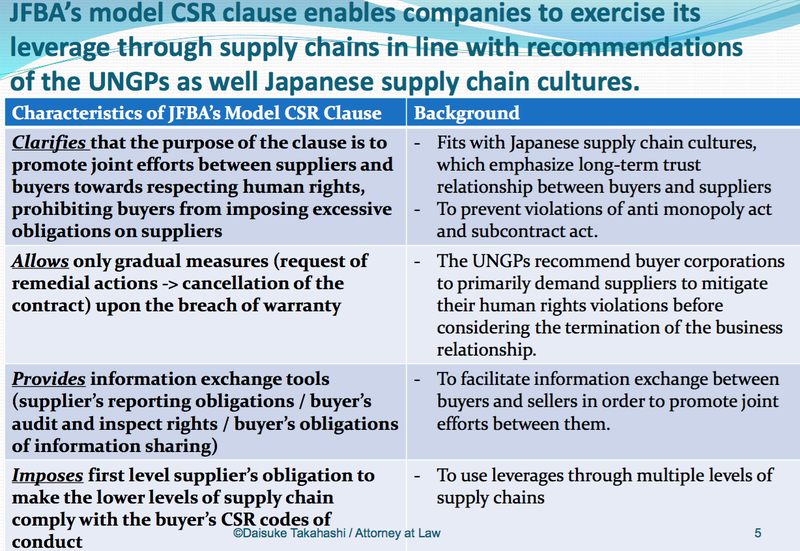 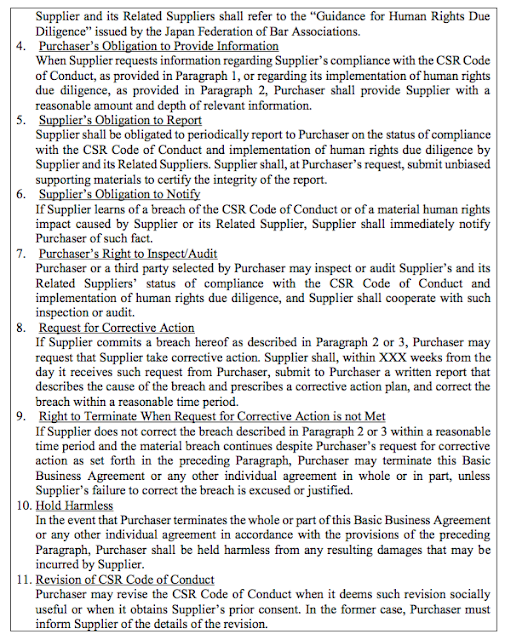 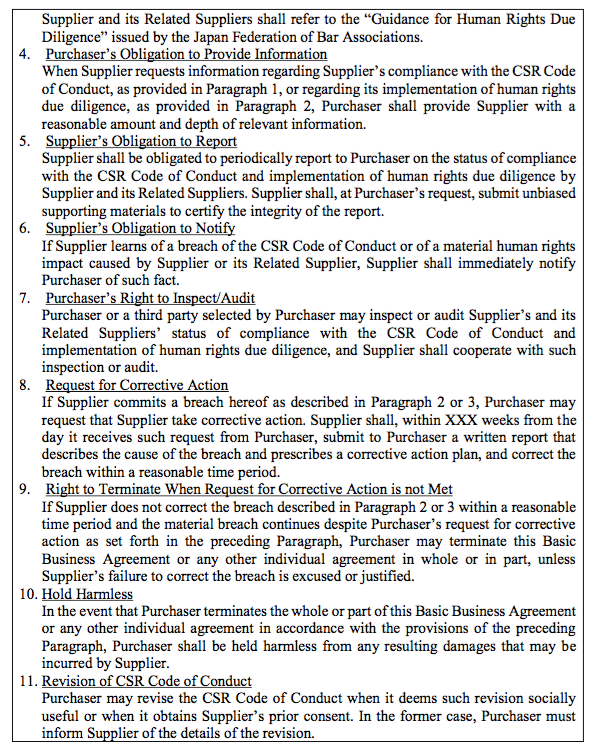 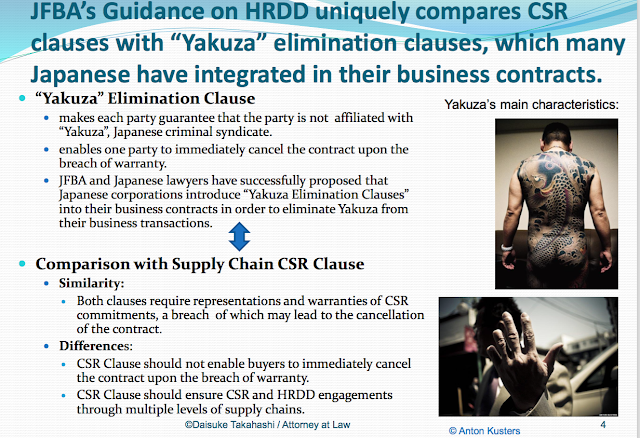 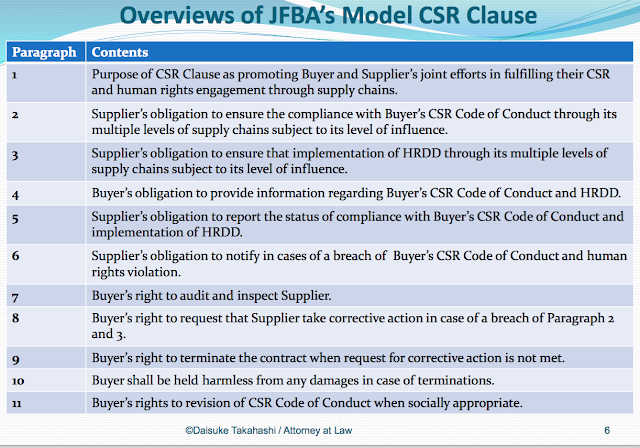 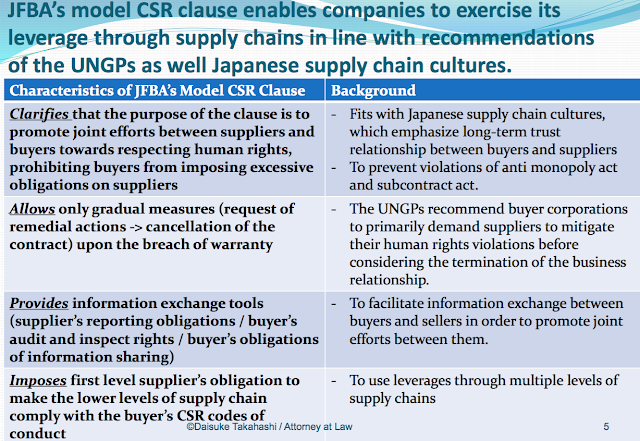 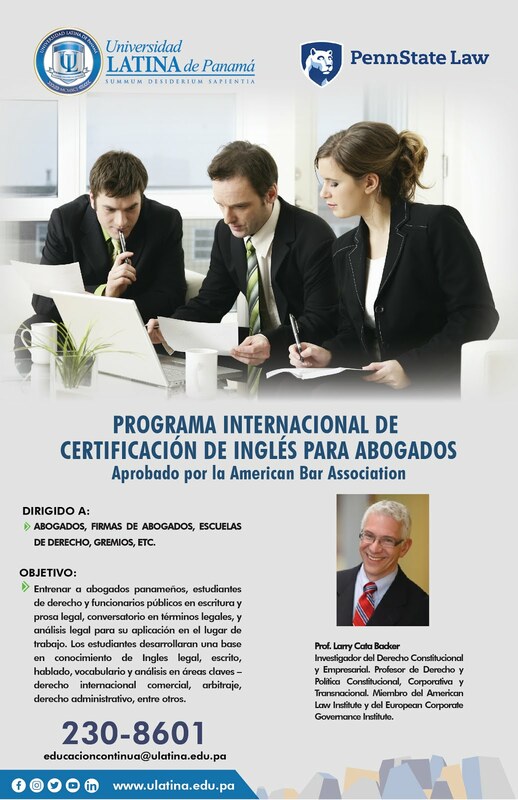 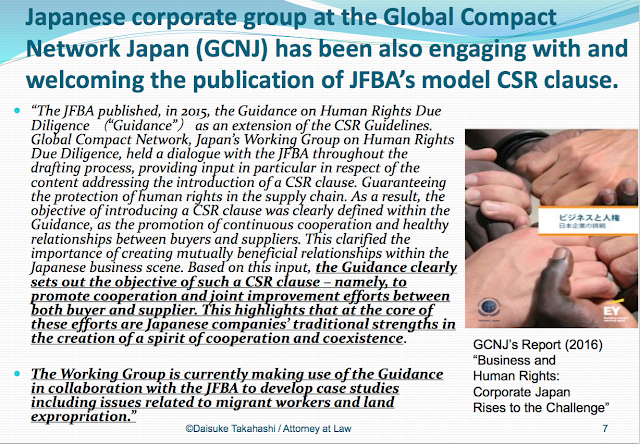 The excellent and quite useful presentation material is provided below along with the JFBA's introduction to its English translation of the Guidance and a Model CSR Clause in a Supplier Contract.